Both these problems dissapeared when I deleted UP~Boomer pack and used old static.ini and .rc files. [23:53:11]	Vendor: ATI Technologies Inc.
[23:53:11]	[-] 'GL_EXT_paletted_texture' extension - Palettized textures (8 bit RGBA palette). [23:53:11]	[-] 'GL_EXT_compiled_vertex_array' extension - Compiled Vertex arrays. [23:53:11]	[-] 'GL_EXT_clip_volume_hint' extension - Frustum clipping optimization. [23:53:11]	[x] 'GL_EXT_secondary_color' extension - Secondary Color for 3D fog & specular optimization. [23:53:11]	[x] 'GL_EXT_separate_specular_color' extension - SeparateSpecular for 3D fog & specular optimization. [23:53:11]	[x] 'GL_ARB_multitexture' extension - Multitexturing. [23:53:11]	[x] 'GL_EXT_texture_env_combine' extension - Multitextures advanced combining for special effects. [23:53:11]	[-] 'GL_NV_texture_env_combine4' extension - Multitextures advanced combining for special effects. [23:53:11]	[x] 'GL_EXT_texture_env_dot3' extension - Dot3 Bump advanced combining. [23:53:11]	[x] 'GL_EXT_texture_filter_anisotropic' extension - Anisotropic texture filtering. [23:53:11]	Trying to AutoMount SFS_AUTO\sasup_decals_01.sfs... mounted successfully! [23:53:11]	Trying to AutoMount SFS_AUTO\sasup_decals_02.sfs... mounted successfully! [23:53:11]	Trying to AutoMount SFS_AUTO\sasup_effects01.sfs... mounted successfully! [23:53:11]	Trying to AutoMount SFS_AUTO\sas_ai_3do01.sfs... mounted successfully! [23:53:11]	Trying to AutoMount SFS_AUTO\sas_maps_01.sfs... mounted successfully! [23:53:11]	Trying to AutoMount SFS_AUTO\sas_sound_01.sfs... mounted successfully! [23:53:11]	Trying to AutoMount SFS_AUTO\sas_sound_02.sfs... mounted successfully! [23:53:11]	Trying to AutoMount SFS_AUTO\Through JSGME - Big Clouds by Manysh.sfs... mounted successfully! [23:53:11]	Trying to AutoMount SFS_AUTO\Through JSGME - Blender Waves by Herra Tohtori.sfs... mounted successfully! [23:53:11]	Trying to AutoMount SFS_AUTO\Through JSGME - Cowling Engines & Prop by PA_Jeronimo.sfs... mounted successfully! [23:53:11]	Trying to AutoMount SFS_AUTO\Through JSGME - German Gunpods by PA_Jeronimo.sfs... mounted successfully! 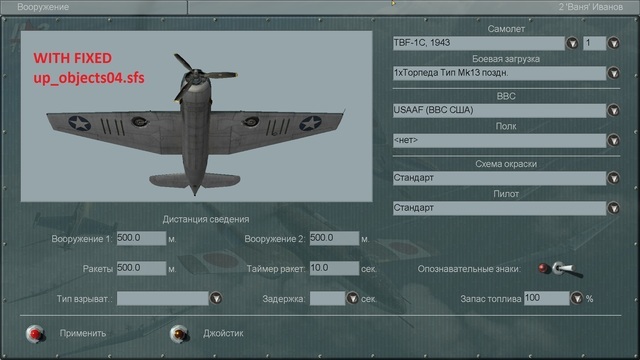 [23:53:11]	Trying to AutoMount SFS_AUTO\Through JSGME - Gore For All Planes by Wolfighter.sfs... mounted successfully! [23:53:11]	Trying to AutoMount SFS_AUTO\Through JSGME - Guncam Tracers by santobr.sfs... mounted successfully! [23:53:11]	Trying to AutoMount SFS_AUTO\Through JSGME - HakenCross Disabler.SFS... mounted successfully! [23:53:11]	Trying to AutoMount SFS_AUTO\Through JSGME - New Mod Wheels by PA_Jeronimo.sfs... mounted successfully! [23:53:11]	Trying to AutoMount SFS_AUTO\Through JSGME - SAS FX Small Collection.sfs... mounted successfully! [23:53:11]	Trying to AutoMount SFS_AUTO\Through JSGME - Water=4 by Carsmaster.sfs... mounted successfully! [23:53:11]	AutoMounting SFS files from folder SFS_AUTO finished. [23:53:18]	Playback format is set : sampling rate = 44100, num channels = 2. [23:53:18]	Buffer caps : Transfer rate = 0, CPU overhead = 0. [23:53:18]	Default speaker config is : 1310724. Problems with IJN Hosho CVL and TBM/TBF large armament were solved very easy! 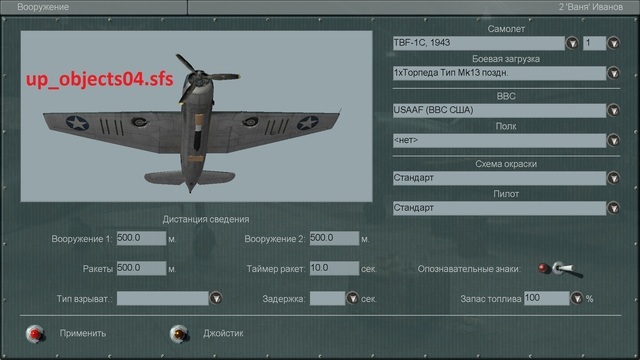 I have put the up_object.sfs lines in .rc file to the top after @load com.maddox.il2.game.cmd.CmdSaveWeapons and before all other sfs lines. Both problems dissapeared after this without any fixed sfs. I hope I will not detect other problems caused by this transposition. Before this transposition the up_object.sfs lines were in bottom of the list before #preload REGISTER as I found here: http://www.mission4today.com/index.php?name=Downloads3&file=details&id=1621. Supplement to the fashion of the USSR-86. Very good stalker,very good . This folder is a bit tricky as it was well over 100mb. It seems that they are not complete.